Since about 2006, ministers, representatives and administrators of at least three federal and three provincial (BC) ministries – CIC, RCA, Finance, Justice – issued or/and approved unlawful and unconstitutional policies (MoU, IP 2, CIC sponsorship forms, etc.) to override the laws of Canada including the IRPA, its Regulations and the Charter, violating 20 to 60 paragraphs of the laws of Canada (and partly those of BC). Their declared aim was “streamlining” but in reality those violations served for a money extortion and money laundering scheme to use the re-victimized sponsors in the family class as cash cows, by forcing them to pay huge amounts of money to the Crown without any proper legal basis while not allowing them to defend themselves at any Court. Many or most of those sponsors – particularly the ones that signed a sponsorship agreement before the IRPA – have been garnisheed tortuously, retroactively, and beyond the limitation period, without any ministerial certificate required by the IRPA and common law: Canada (Attorney General) v. Mavi,  2 SCR 504, 2011 SCC 30 (CanLII). Due to a double tort or fraud, some of Z.A. 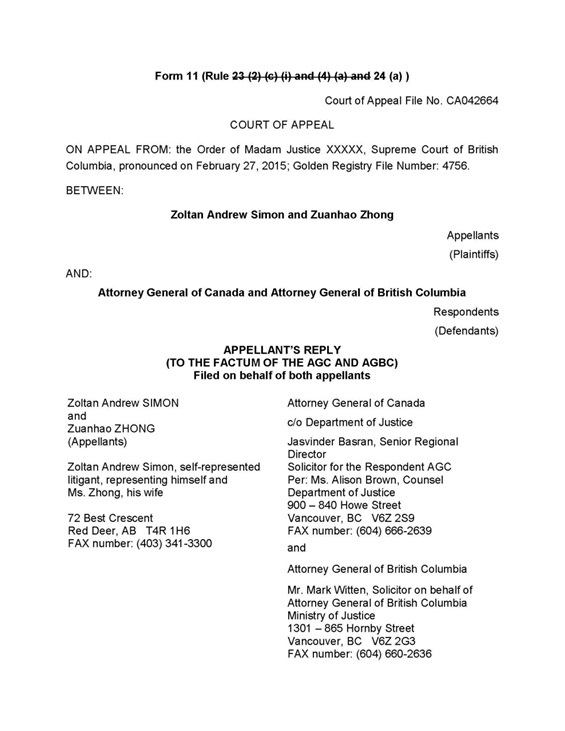 Simon’s actions could not reach the 9-judge panel of the SCC: Ms. W. Bridges, Counsel for AGC, deposited a false testimony to mislead the SCC, claiming that Z. Simon had issues with BC only and the FC or FCA had no jurisdiction over BC, so it was a routine dismissal for lack of jurisdiction. (In those pleadings, Z. Simon had no claim against the BC Government at all.) The second tort is an ongoing violation of s. 61 of the Supreme Court Act that prescribed appeal, instead application for leave to appeal, in cases where error was claimed at the lower courts. Mr. Bilodeau, likely under to pressure of the P.M. or/and AGC, blocks every appeal against the Crown in that category and reserves the last word for himself. His decisions cannot mean the end of any appeal and cannot be called “final” because the Registrar is not a judge. All these reveal Ottawa’s cynical manipulation of the law with the assistance of BC. The appellants pleaded sufficient facts to demonstrate that the ministers (and a commissioner) have agreed to violate Canada’s laws in order to extort monies from one of the most vulnerable social group. The vicarious liability of the AGC and AGBC has been pleaded sufficiently. The Crown does not publish every detail of those agreements or conspiracies (dates, names) that made the plaintiffs’ pleadings a bit vague. Madam Justice XXXXX, in her haste to find some errors and contradictions, failed to assess the substance of the Notice of Civil Claim. She skipped each important legal issue set out in the pleadings, perhaps with the intention to return to those matters later but forgot to do so due to her mild memory impairment. This is not inflammatory: a judge may have a health issue or a bad day. Her vague and superficial Oral Reasons for Judgment seems to have been based on her sweeping assumptions, personal faith or political beliefs, illusions or fantasies. At the first glance, her Oral Reasons appears in brilliant light, reflecting millions of colours. However, that picture is transparent. One cannot see legal essence or any skeleton underneath. If one scratches the surface of that illusory picture, the whole colorful bubble bursts immediately. Her Reasons show us an astonishing literary masterpiece that has little or nothing to do with the laws of Canada, neither the legislation nor the relevant case law, both civil and criminal. Her complete silence about immigration and family class sponsorship reveals that her intention is to undermine the SCC’s final decision in Canada (Attorney General) v. Mavi  that is the closest case to the instant case on appeal. Such shamelessly partisan approach constitutes a palpable and overriding error: a single judge of a province cannot override a key decision of the Supreme Court of Canada, let alone without any explanation or reasoning. A single judge cannot make a silent collateral attack on a final SCC order since such attitude would turn Canada’s common law upside down. Her errors permeated the whole of her “analysis” that cannot be called a proper analysis. The pleadings were not doomed due to an incurable defect, see paras. and  in Phui v. Canada (Minister of Citizenship and Immigration), 2002 FCT 791 (CanLII), by Prothonotary John A. Hargrave. She failed to apply the “clear and obvious” test, the vexatious test, the tests for collateral attack, abuse of process and res judicata. See Petrelli v. Lindell Beach Holiday Resort Ltd., 2010 BCSC 956 (CanLII), para. . She ignored the rule against absurdity. In AGC’s Factum, Page iii, para. 3, “The appellant’s allegations against Canada have already been considered and dismissed by the Federal Court…” and “the appellant attempts to re-litigate” are false and misleading. The Federal Court has always concluded, regarding the relevant pending questions of law, that the Federal Court had no jurisdiction just because the BC Government’s involvement. A denial of jurisdiction does not mean a hearing of the issues on their own merit. Those denials in the FC and the FCA simply meant that Z.A. Simon was at the wrong court where BC was not allowed to be sued. There were no final judgments because the Registrar of the SCC personally denied to file an appeal as of right, violating s. 61 of the Supreme Court Act. A personal or informal letter of the SCC’s Registrar is not a final order of the Supreme Court of Canada. The word “Court” excludes the Registrar. None of the previous courts involved (FC, FCA, SCC) have dealt with the issues on their merit. None of the judges ever stated any constitutional question. A total silence of the courts on key issues is not a “final decision.” The final decision was about their lack of jurisdiction. The instant appellants had no intention to challenge or undermine such “decision.” The appellants’ pleadings did not seek a declaration of the Supreme Court of BC to state that the previous courts erred for denying jurisdiction. Such request would have been an abuse of process. Page 1, para 1: The AGC “does not agree with the appellant’s Statement of Facts” but he accepts those facts in Page 1, para. 3. This is inconsistent, revealing bad faith. Page 2, para 4 (b) contradicts the Crown’s (and Madam Justice’s) claim of res judicata. Seeking an order compelling the IAD to issue a decision was a complaint about Canada’s delay that has no corresponding item in the Notice of Civil Claim of 2014. On Page 4, para. 6: the wording “bizarre assertions” rather refer to Counsel’s pleadings and the Oral Reasons. The appellants are able to prove them so they cannot be bizarre or assertions. On Page 4, para. 7: “many of the alleged causes of action … were not known to law.” [Both the motions judge and Counsel failed to specify those “many” issues. There is none.] On Page 4, para 7: the listed “spurious” claims have been well supported by material facts. They may have been raised in a criminal action. The present one is civil or quasi-criminal. It may be converted to criminal if the Court would order so. But why would an AG wish to lose a criminal action, instead of a civil one? Page 5, para. 12: The Judgment and the Oral Reasons were silent about the alleged disqualification of Ms. Zhong as a party. The Crown could not cite any rule or case law for it. It is too late for the AGC to invent such new objection. He must obey the “fresh step” rule. Page 8, para. 18: “the relief cannot be granted” [a relief against a Charter violation cannot be granted]. Only an impartial court can decide whether it can be granted or not. Page 9, para 23: the word “both vague and over-inclusive” is like claiming that a coffee is too hot and too cold at the same time. Page 10, para 27: It is false. The Applications Judge did not take any allegation in the notice of civil claim as true. Nothing was incapable of proof. Page iii, para 4: “unwilling or incapable” is inflammatory language against the appellants. Rather, the Crown, by many [or better and better] counsel in its 7-year odyssey has been completely incapable or impotent to defend its torts properly, only by a false testimony of Ms. Bridges. On Page 10: para. 26: the “certain to fail” is untrue for a verdict of the BC Court of Appeal that would be issued after October 19, 2015. Since the majority of judges is impartial, such “certain to fail” claim is not valid before 19 October 2015, either. Since the Motions Judge has failed to apply any related test properly, the Crown has zero legal basis to claim such items. The action was brought for the assertion of legitimate rights and not for threat, oppression, or improper purpose, contrary to the Crown’s motions. Counsel and the Motions Judge agreed that the Notice of Civil Claim contained 20 to 60 allegations or claims against the Defendants. The Rules and common law dictate for a judge that each (here about sixty) factual allegation must be taken as true unless they are patently impossible or ridiculous. Here the Motions Judge and Counsel were unable to pinpoint a single allegation or claim that was incapable of proof. There was none. Thus, all the 60 or so allegations should have been taken as true. These, and the diagrams, are not “trifles” like paper clips or toothpicks but refer to the key roles of the SCC and any other court. The essence of both initial judgments years ago (i.e., the order of Mr. Justice Zinn [A] and the unpublished twin orders of Madam Justice Tremblay-Lamer [B]) was that the FC and the FCA lacked jurisdiction just because the “Government of BC” [in A] was involved or simply mentioned. In case [B] the Court felt that it had no jurisdiction over the acts or omissions of the SCC Registrar. As for the rest of their judgments, the instant appellants are not challenging them: they do not question the validity or enforceability of those two FC orders, the IAD decision, etc. Their Statement of Civil Claim  alleges distinct causes of action (damages, fraud, money extortion and laundering, state terrorism, Charter breaches, false testimony, etc. ), also new evidence, so there is no abuse of process at this Court. Also, a judge is not allowed to dispose of matters of law that were not fully settled in the jurisprudence. Mr. Justice Zinn may have seen clearly that the AGC and AGBC agreed to overrule the laws that was equivalent with conspiracy. He could not have solved it with one conspirator. See in para. of S.M.J. v. R.H.C.W., 2003 BCSC 1870 (CanLII). Page 306 of Wavel Ventures Corp. v. Constantini, (1996), 46 Alta. L.R. (3d) 292 is similar. On Page 6, paras 15-16, the AGC complains that “Fresh Evidence” cannot be introduced. This Honourable Court may order that the documents at 15 i), j), k) and l) shall be listed under the AUTHORITIES. They override the laws of Canada so they are authorities. The Rules specify and allow most the rest at para. 15. They were filed before the motions. Justice must not only be done but it must be seen to be done. Although the appellants do not claim bias, for a right-minded person it may seem that the motions judge has attempted to buy personal advancement by issuing a judgment that brings the good reputation of Canada’s other judges and the administration of justice in disrepute. She hides the quasi-criminal errors and omissions of those federal ministers and their provincial counterparts. The Motions Judge ignored the number (20-60) of genuine issues for trial. It is a palpable and overriding error to assume that every relevant test is discretional for a judge and she can skip all of those. The magic word “irrelevant”, often repeated by the Motions Judge and both Counsel, aims to support their unfounded and empty sweeping allegations. In a motion’s hearing stage – that does not allow to show any evidence – no one can state by 100% certainty what is relevant and what is irrelevant to the case. A judge whose legal or Standard English or understanding of diagrams is imperfect [so he/she cannot understand, say 10% of a pleadings] should ask the Chief Justice to assign the case to another judge. The Motions Judge claims that the pleadings was hard or impossible to understand but she claimed that most of its facts or circumstances were irrelevant. If she could not understand its essence how could she decide by 100% certainty that most of those 192 paragraphs were irrelevant? She failed to ask Z.A. Simon a single question about res judicata because he could have given her a good argument and denial. At the end of the motion hearing she decided that the trial scheduled to March 15-17 was now dismissed although she could not see any incurable defect, not even on February 27. This is a sign of her predetermination to close the matter without a trial where evidence is allowed. If the Motions Judge took all the 192 factual allegations as true, so the Crown has really violated 20 to 60 laws or paragraphs of Canada and/or British Columbia, this means her approval of the errors or crimes. It is a palpable and overriding error in her Oral Reasons. A basic duty of a judge to show at least the illusion of justice so the courts have an important role, so there is need for judges. Madam Justice XXXXX has failed in this aspect. Dated at the City of Red Deer, the Province of Alberta this 27th day of July, 2015.